We’ve spent countless hours reading thousands of reviews on dozens of reading pillows. We have also conducted thorough research on pillows for reading in bed and their effects on sleep. You can believe we’ve done everything in our power to give you the most accurate reviews possible so you can have the best reading pillow. Our research efforts are funded by making a commission on any products you choose to buy through our website. 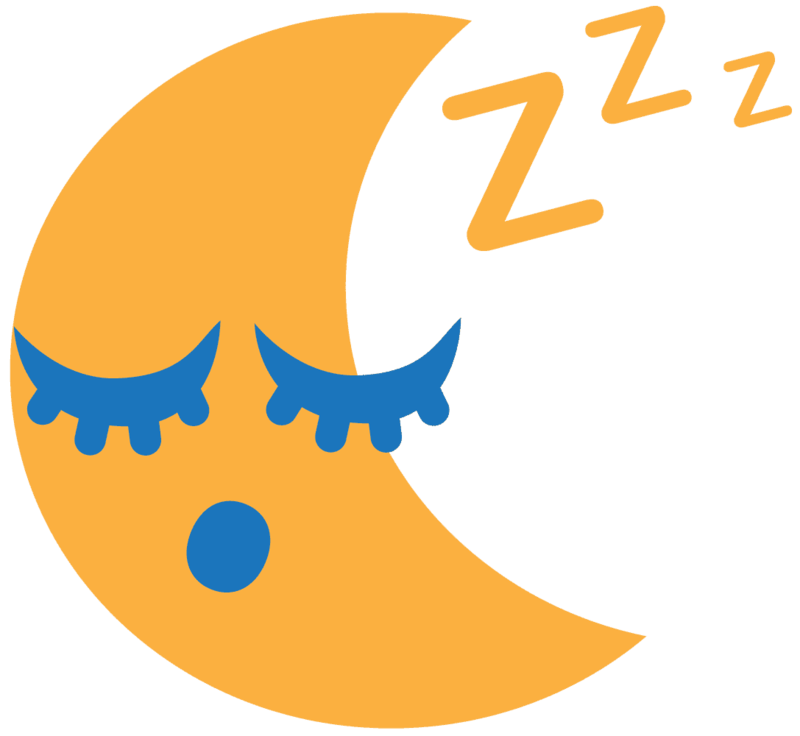 This allows us to continue bringing you comprehensive reviews and advice on everything sleep related . Reading pillows are beloved by anyone who enjoys a good book, is studying for school, or who works long hours. The best back support pillows on the market can help you read more, study better and be more productive when you take your work home with you. What are the best reading pillows on the market? We’ve taken a look at nearly all back-rest pillows, and have selected the best of the best. If you’re looking for a comfortable reading pillow, consider the options found below. 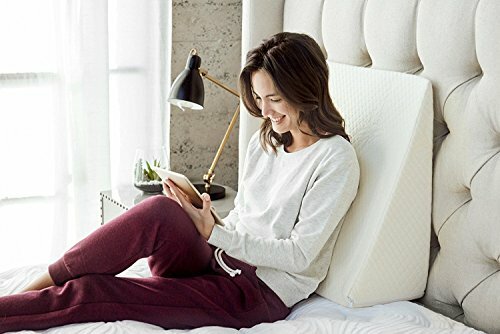 Why a Back Support Pillow for Reading in Bed? When you want the best back rest pillows, look no further than the InteVision Foam Wedge Bed Pillow. This pillow isn’t designed like traditional pillows for reading, but it delivers benefits that far exceed what traditional options offer. First, the InteVision option is the most comfortable you will find. It offers a 1.5-inch memory foam layer atop a firm base that delivers the perfect blend of comfort and support. The pillow itself is designed to maximize air circulation, too, which means you won’t overheat during sleep. This option also comes with a machine-washable cover that is exceedingly easy to get on and off — which isn’t the case with all bed reading pillows. You can even purchase additional cases for this Foam Wedge Bed Pillow — 400-thread-count, 100% Egyptian cotton replacement cases make the pillow even more comfortable. Finally, this pillow helps with more than just reading, studying, and working. It also aids those suffering from acid reflux, as well as those who struggle with snoring and allergies. A more traditional option, when searching for the best bed reading pillow with arms, is the Linenspa Shredded Foam Reading Pillow. What does “traditional” mean? Most back support pillows are designed with a large section that supports the back, plus smaller ones that stretch out to support the arms. This pillow, made of soft velour and crafted for enhanced airflow, is designed for maximum comfort. It is available in a standard size or extra-large, and also includes a handle at the top — which makes it simple and easy to transport. If you’re looking for protection with your purchase, this model from Linenspa comes with a 3-year warranty. Critics of this bed reading pillow say that it’s not very attractive, but that it’s a small price to pay for one of the most comfortable options on the market. Many who are in search of the best back-rest pillows are looking for something that helps with — you guessed it — reading. Imagine that! Believe it or not, some bed reading pillows aren’t great for reading at all. Some are better for watching TV, some are better for working, and others are better for sitting on the floor. The Brentwood Originals Brushed Twill Bedrest — considered the best option for reading — is made of polyester brushed twill fabric and polyester fiber fill. This type of construction means equal amounts of comfort and support. As a bonus, you will also enjoy affordability when you choose this option. If you’re interested in aesthetics, you can choose from different colors too. While some pillows for reading in bed aren’t attractive, you can closely coordinate this back support pillow with your existing bedding. Of course, as you’re reading, you might spill a drink or drop some food on your pillow. One of the best things about this option is that it’s incredibly easy to clean using a damp cloth. The Brentwood Originals Shagalicious Bedrest pillow is visually appealing and great for back support. This reading pillow for bed is made of a shaggy and soft polyester, which makes it incredibly comfortable to sink into after a long day. Back support is vital, whether you’re reading, studying, working or sitting on the floor. 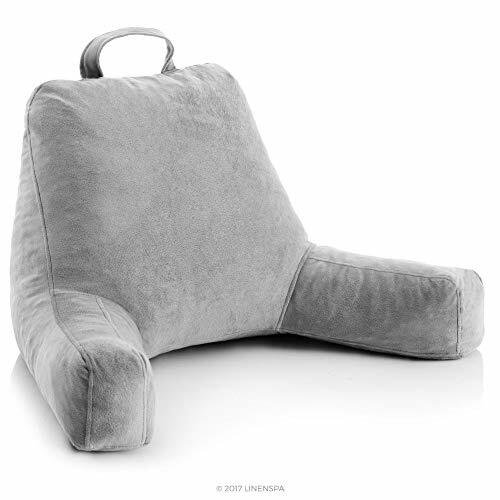 If you don’t have back problems, a reading pillow like the Brentwood will help you avoid them. If you do have back problems, this reading pillow will help you read, study or work in comfort. While not everyone may appreciate the 3 available colors — lime green, turquoise and hot pink — this 70s-inspired back-rest pillow is incredibly comfortable and delivers superb back support. Many people searching for the best back support pillows are most interested in value. If you’re someone looking for back-rest pillows that deliver value, check out the Brentwood Foam Bed Wedge Pillow. This non-traditional design delivers unexpected benefits to anyone who reads, studies or works often while in bed. This option from Brentwood features a gradual slope that also helps with issues that may lead to sleep challenges such as snoring, acid reflux, allergies, poor circulation, etc. The slope of the pillow can also help with back or neck problems. As a bonus, this option from Brentwood is hypoallergenic and resistant to dust mites. This product makes the list of best back-rest pillows for a myriad reasons, but perhaps the biggest reason is you get all of these benefits at an incredible price. Pillows for reading in bed are definitely nice to have. But not all bed reading pillows are created equal. For example, you can stop by discount stores and find bargain-basement options. But these off-brand reading pillows won’t hold up for long, and they definitely won’t be as comfortable as the best back support pillows. The best reading pillows are designed for durability and comfort, and they also promote ergonomically correct reading positions. You may even find back-rest pillows that can help prevent snoring, acid reflux and allergies. Decide on what the most important features are to you, and then find a back-rest pillow option that delivers the goods. If you’re going to invest the time and money into getting a pillow for reading in bed, you owe it to yourself to find one that meets your exact needs. And there are plenty of other activities, hobbies and pastimes that people feel most comfortable doing while in bed. However, it’s hard to use traditional pillows while engaged in activities other than sleeping. That’s why the reading pillows are so valuable. They provide support for a different sitting posture when you’re doing something other than sleeping while in bed. When you’re reading, studying, working, watching television or folding clothes, back support pillows help you sit in a better position. Anyone could use a good back-rest pillow, right? After all, almost everyone spends non-sleeping time in bed. And it doesn’t take long to realize that traditional pillows aren’t much help when reading, studying, working, and watching TV. There’s a good reason why the best back support pillows are so in-demand by everyone from college students to working professionals. They are helpful when you’re trying to relax, when you’re trying to be productive, and when you’re trying to alleviate a wide range of health issues. So, are you in the market for a reading pillow for bed? 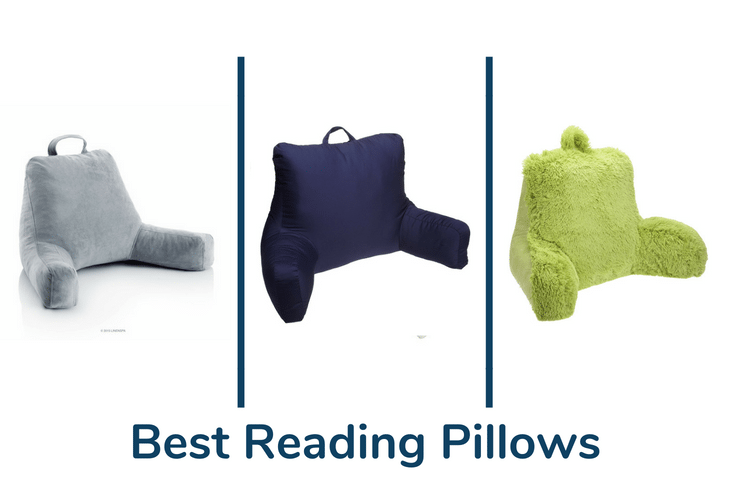 If so, we’ve got you covered with special recommendations for the best reading pillows in different categories. Read on to learn more about the best pillows for reading in bed and what they have to offer. Okay, so you have a few options to choose from when shopping for the best reading pillows. But which option is the best one for your unique needs? Here are 5 things to consider as you narrow down your options and focus on the best pillows for reading in bed. Price is always an important factor, even if you have an unlimited budget. We’re all looking for value as consumers, and so you want to choose the pillow that delivers the greatest value to fit your needs. That might mean paying $20, $50 or maybe more. Pillows for reading in bed come in a range of different materials. For example, you can look through the options above and find pillows made of velour, polyester and other materials. You need to ensure that you love the way your pillow feels, so look for a material that feels good against your skin. The best reading pillows fall into two large design categories. You’ll find the traditional design that includes a large pillow for the back and then extensions to support the arms. You’ll also find the wedge design, which is simply a pillow that features a gradual slope. Which type of pillow best meets your needs? Looking for a hypoallergenic option? Need a back-rest pillow that’s easy to clean? These features are important when shopping for bed reading pillows. Make sure you’re getting an option that includes the features that are most important to you. Some people shop for the best reading pillows in order to address specific health issues or concerns. Perhaps you have a problem with back or neck pain, snoring or even allergies. Find a back support pillow that is known to help people experiencing similar health issues. Are reading pillows good for kids? Absolutely! 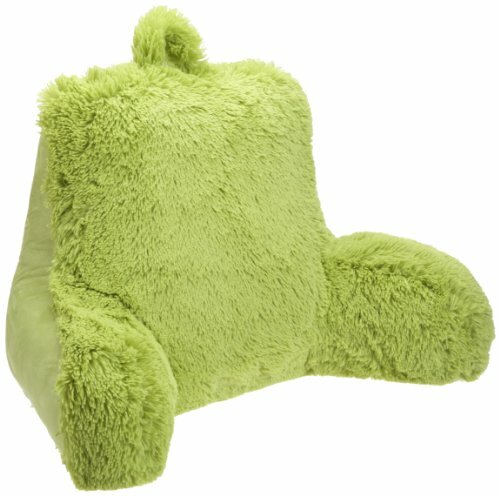 You can find reading pillows that are specially designed for younger kids. But, as kids get into late elementary school, you’ll find that adult-size reading pillows meet their needs just fine. Just like adults should focus on key decision factors when shopping for back-rest pillows, kids should do the same. Does your child need a reading pillow for a specific purpose? Does he or she prefer a certain type of material? 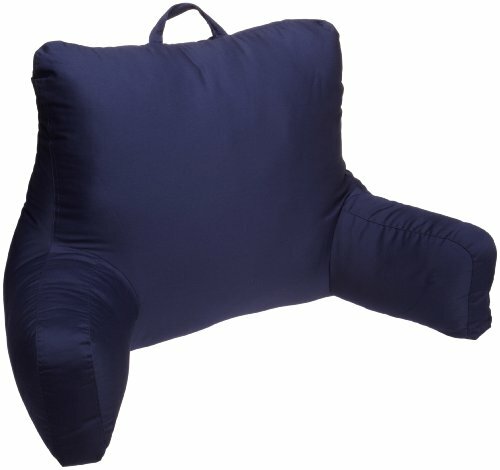 Is the reading pillow meant to alleviate some health issue? Let those questions drive your search. How do you clean a reading pillow? There are two basic ways to clean reading pillows. Many have removable cases that can simply be thrown into the washing machine. This sounds easy, but sometimes the cases are difficult to get back on the pillows after washing and drying. Other reading pillows are easy to clean using a damp cloth. For tough stains, try using upholstery cleaner. Can you make your own reading pillow? In theory, you could make your own pillow for reading in bed. But think about how much it will cost to collect the materials, and think about the time you would spend sewing. It’s far more time- and cost-effective to simply buy an option from among the best reading pillows, given how affordable and accessible they are. Where can you buy a reading pillow? You can buy reading pillows from many different brick-and-mortar stores. But the easiest way to find the best reading pillows is through Amazon. You can browse the greatest number of colors, options, styles and designs, and your new reading pillow will arrive at your doorstep in no time. Choosing your best option from among the available back support pillows is a great way to better enjoy your bed. It doesn’t have to be just for sleeping, you know. Getting a reading pillow can help you spend more time reading, studying, working or watching TV while staying as comfortable as possible. Be sure to carefully consider what you want most out of a back-rest pillow. Then, search through the options above to find the one that best meets those needs. When you put in the time and effort to research the best fit for your needs, you can’t go wrong. You won’t be disappointed in how bed reading pillows can transform your bedroom experience!